So, Follow Your Crazy turned 2 yesterday. I can’t believe it. I would be a little more celebratory of this if I had been faithfully writing this whole time, but I seem to have fallen off the Earth again. Lots of adjustment period going on here, in this new home which I love and adore. BUT, one of the big things that’d been getting me was that I sit at a desk in front of a computer all day long…coming home and sitting at another desk in front of another computer just wasn’t inspiring me. SO, J and I got ourselves a laptop tablet for Christmas. Follow Your Crazy is portable, y’all! Greetings, from my front porch. Ahhh, this is more like it. So now, for FYC’s 2nd birthday, I am going to work on giving her a little bit of a makeover. New banner, that sort of thing. She needs it! And I swear by my own crazy soul that I will write more. Anyway, before all that: HAPPY CARNIVAL SEASON, everyone! I love this time of year, here. This place is always magically and uniquely weird, but this is the time of year that drives home just what a different planet we live on, here in New Orleans. It’s the vibe. I mean, man, January 6 came and the magic has already started. 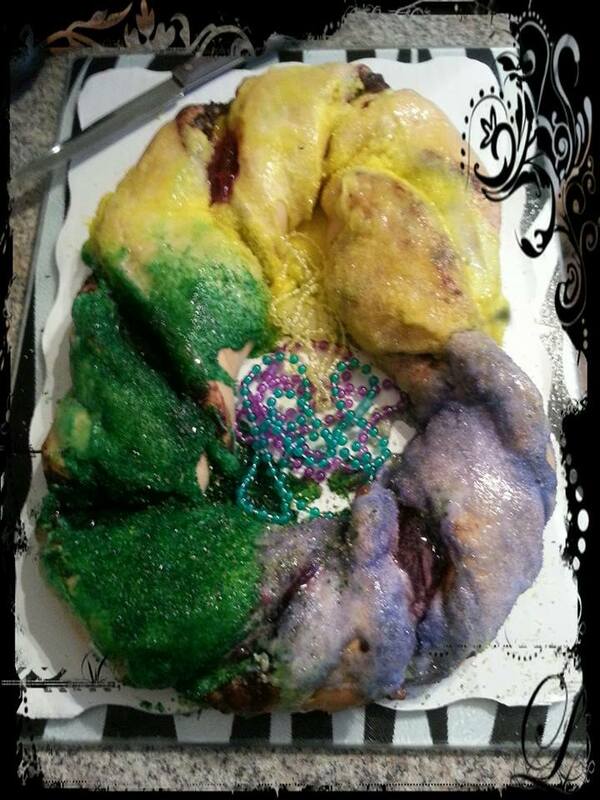 King Cakes in our faces, party plans emerging, parade maps perused. Houses are starting to drop their stale Christmas decorations like a snake shedding skin, that glowing PurpleGoldGreen layer emerging from underneath. It just feels good, to be where you belong. So we blared brass music and decorated the house and it was one of those Sundays where yeah, it was kind of just a Sunday, but it was a little party too. 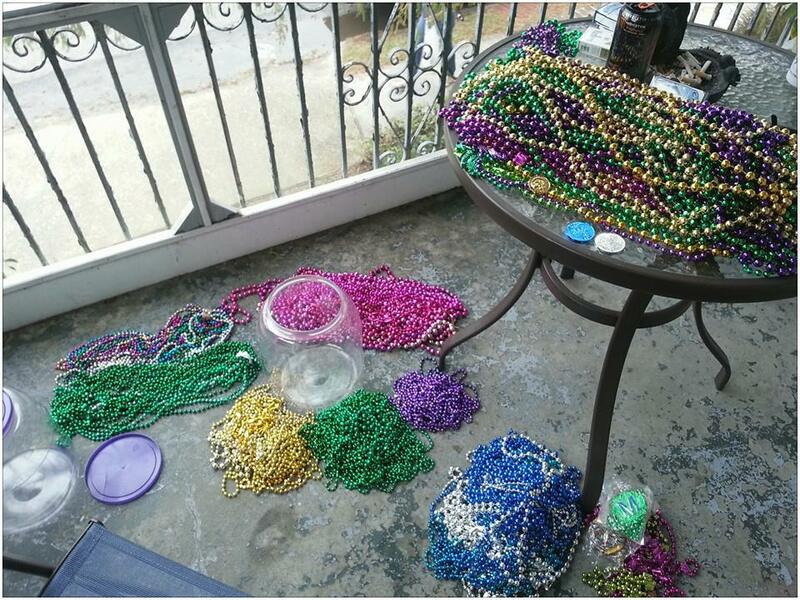 I started by sitting on the porch, sorting all the reg’lar beads that we caught last year. 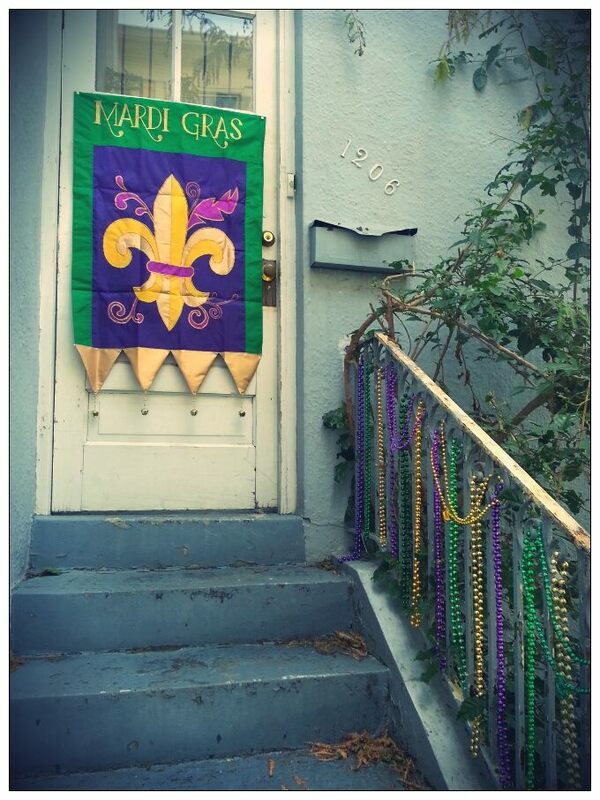 I pulled out the fatter purple, green, and gold ones for the railing out front. The rest of them are going to a friend of mine who is gathering booty for her ride in Nyx this year. I think it’s kismet that I wound up with so many pinks last year. Some of the remaining greens will be handed off to my coworker’s college-age son, who is rolling for St. Patrick’s Day for the first time this year, too. 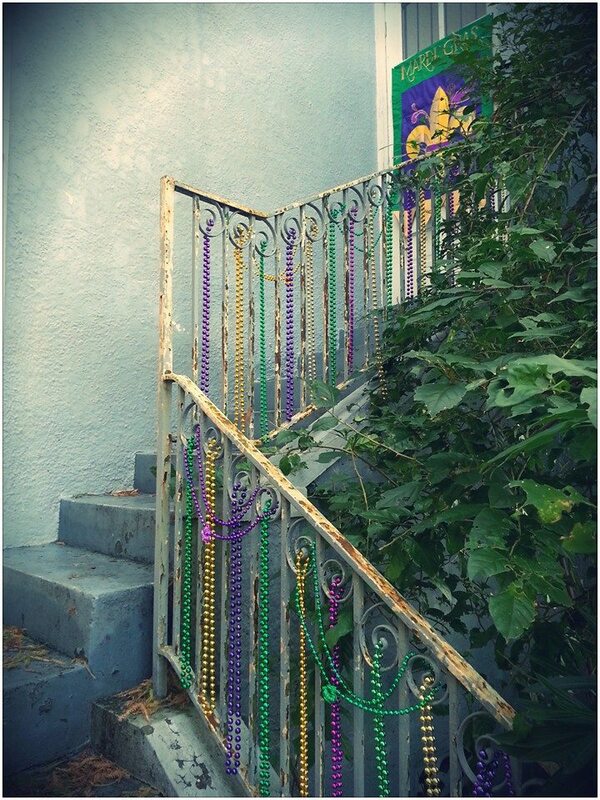 Got the rails strung – we did a similar thing for Christmas, using solely what we caught at the Krewe of Jingle parade in December. Parades are handy things. 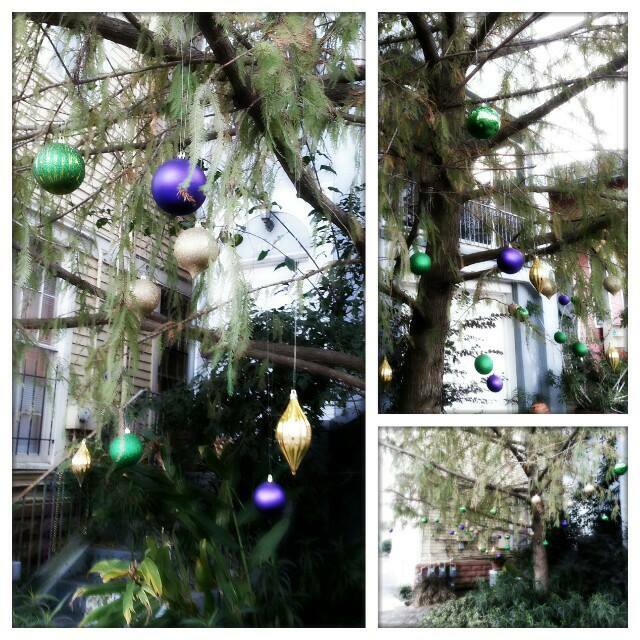 J put a bunch of ornaments on fishing line and decorated the tree out front. And then the glee moved indoors. We rummaged out the old stuff we used to use in Colorado, and added the scepter which our Irish buddy gave us last year on Babylon/Chaos/Muses night. Of course, the Bead Dogs stand guard. We did lights, too, don’t doubt that! We were bummed that the old strand of mask lights, a feature at every Mardi Gras party in Colorado that we all did, finally bit the dust. 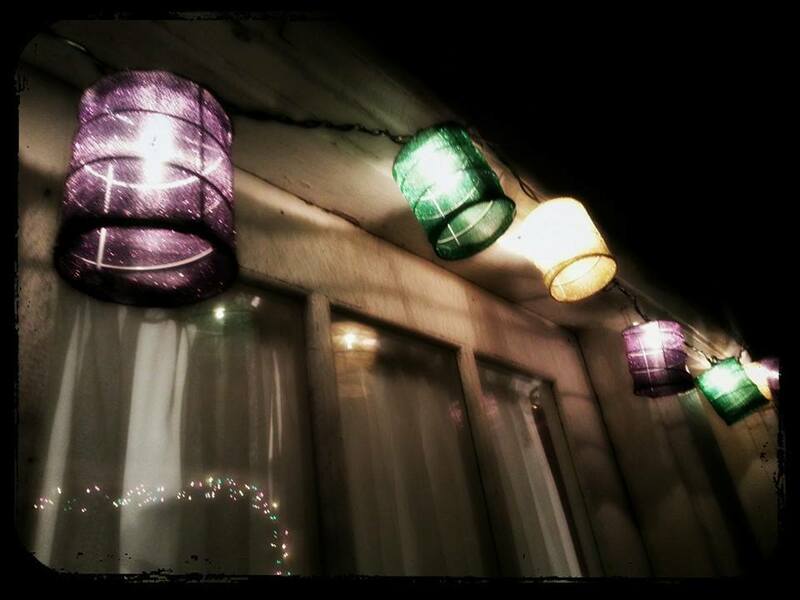 We found some cool lantern-y ones though! And, of course, we had to pick up our fist King Cake of the year. We busted into that around 7:00 a.m. on Monday, January 6. Unfortunately, this particular King Cake was procured at Walmart (I know, I KNOW, but it’s nearby and had lights and decorations and things). Although pretty, I don’t recommend them. Kinda stiff and dry and the wrong kind of gooey, we won’t be doing that again, with all the awesome options we have around these parts! So there you have my first King Cake review of the year. J, of course, got the baby. He has skillz at that. And there we go. It has begun! What a cool season this is going to be. 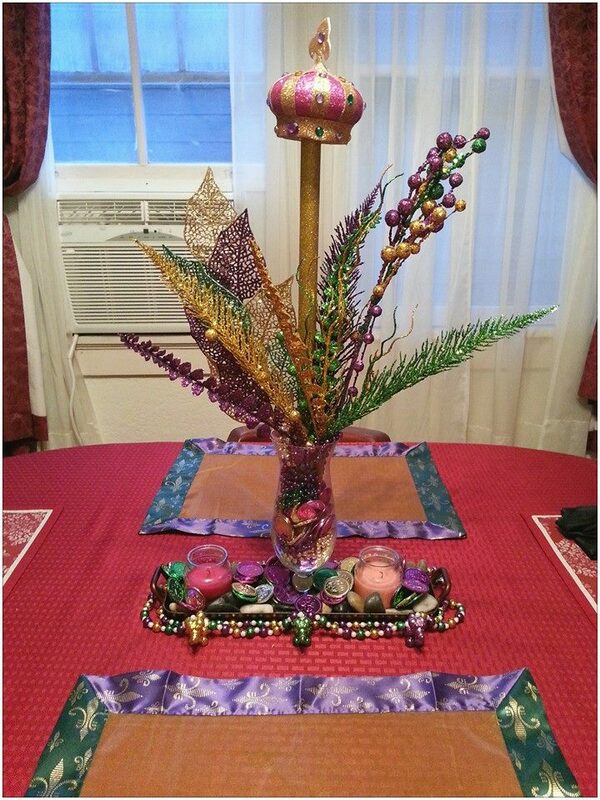 I received an invite the other day to the Krewe of Iris Ball in February. We are so excited! Our first krewe ball! Thus, now that the decorating is done, and we have our parade schedule mapped out, we’ll soon be off to rent a tux and go evening-gown shopping. What a world. Glad you got your new machine! Have fun ya’all! Thanks! Me too – it is making such a world of difference!